After the one of the hottest summers here in Oklahoma that I can remember, Halloween is finally approaching and I am busy scouring magazines and the internet for fantastical ideas for this years party. Being that it was the year of the last Harry Potter film AND that my daughter started reading (and loving!) the books on her own this summer, we naturally chose to transfigure our house into Hogwarts. I have been bursting with a list of fabulous ideas, but no time to execute lately. So today, I put my broomstick down and worked on a set of Harry’s text books. 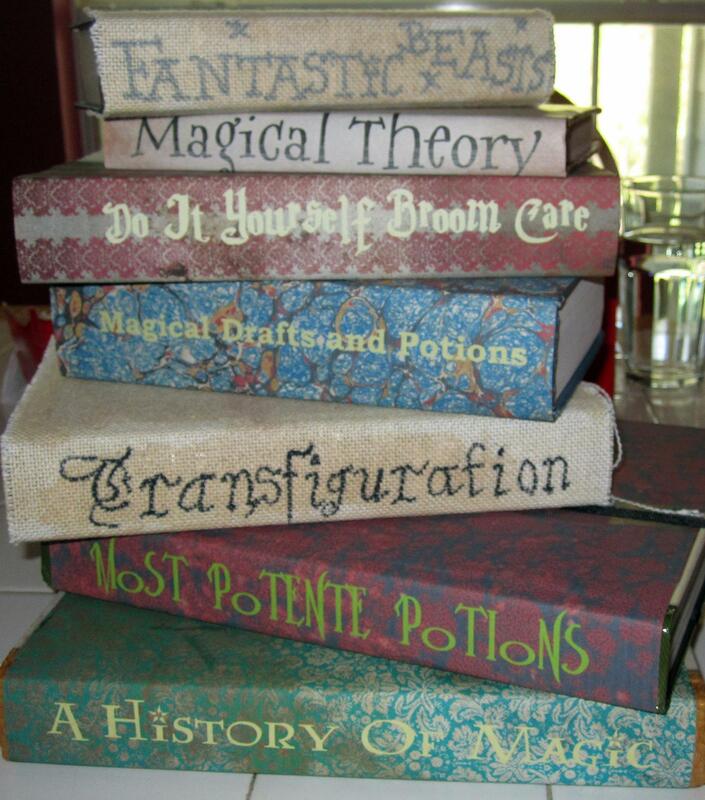 There are tons of elaborate tutorials on how to make a set of Hogwart’s text books. They range from making a book from scratch to resurfacing the cover. Those are way more work than I wanted to do so I decided to wing it and figure it out as I went. I am definitely one of those not read the directions and just figure it out types. Several weeks ago, I bought some old Reader’s Digest books and other various sized books at a local book store. We also get the enormous Cabela’s catalog that comes with a hard cover and is the size of a textbook. In fact, for some reason, this year we got two. So those two tomes combined with what I bought at the used book store gave me a selection of seven books. I found a list of book titles and chose the ones that I liked and that would most likely fit on the spines of the books. At first, I tried wrapping a couple of books in a burlap type fabric and then painting them with tea and coffee to help age them. They looked ok, but I wasn’t thrilled with them. Then I had the idea to use paper and do book covers. I found this nifty website that had textures. I downloaded several textures from their site and set about picking which ones would go with which title. I had already downloaded and installed some Harry Potter fonts from MuggleNet. Once I had the right texture, I added text to the image and printed them out. I used rubber cement to attach the paper and voila! It was a fairly easy project and my daughter could have easily helped (she was at school). If you decide to make some book covers, be sure you have plenty of color ink on hand and verify that the lettering is going the direction you want. It’s no fun having to run to Flourish and Blotts right in the middle of a project. Hey, how cool! This could be some awesome geeky decor!